When the 13A Bill was forwarded to the then Supreme Court, the only determination the Court was constitutionally required to make as per Article 120 (a) was whether it required “approval by the People at a Referendum”. It could be legitimately concluded that 5 out of the 9 Judges of the then Supreme Court found that the 13A Bill AS PRESENTED required a referendum. However, the determination forwarded by the then Chief Justice Sharvananda to Parliament stated that 4 Judges did NOT order a referendum, 4 others found the Bill required a referendum and the 9th Judge stated: “The provisions of Article 154G (2) (b) and 154 (3) (b) of the Bill to amend the Constitution of Sri Lanka (Thirteenth Amendment to the Constitution) require approval by the People at a Referendum by virtue of the provision of Article 83”. The then Parliament took upon itself to delete the requirement for a referendum from the original Bill, and passed the Bill without making the needed revisions as well as without resubmitting it to the Supreme Court. The 13th Amendment is being assailed primarily from two fronts. One front has revived the illegality/unconstitutionality of the 13 A that was first raised on September 9, 2009 in an article to The Island while the second front is marshalling forces to repeal 13 A on grounds that it is too restrictive and limiting. Despite the fact that the latter aspect of 13A was also brought to the attention of the public through several articles, it is not until the procedural restrictions required by 13A was demonstrated during the passage of the Divi Neguma Bill through the Supreme Court that the political establishment realized the full impact of 13A’s limitations relating to issues of governance. The responsibility for the illegality/unconstitutionality of 13A should be collectively borne by the then Supreme Court and the then Parliament. When the 13A Bill was forwarded to the then Supreme Court, the only determination the Court was constitutionally required to make as per Article 120 (a) was whether it required “approval by the People at a Referendum”. It could be legitimately concluded that 5 out of the 9 Judges of the then Supreme Court found that the 13A Bill AS PRESENTED required a referendum. However, the determination forwarded by the then Chief Justice Sharvananda to Parliament stated that 4 Judges did NOT order a referendum, 4 others found the Bill required a referendum and the 9th Judge stated: “The provisions of Article 154G (2) (b) and 154 (3) (b) of the Bill to amend the Constitution of Sri Lanka (Thirteenth Amendment to the Constitution) require approval by the People at a Referendum by virtue of the provision of Article 83”. The then Parliament took upon itself to delete the requirement for a referendum from the original Bill, and passed the Bill without making the needed revisions as well as without resubmitting it to the Supreme Court. (1) the determination of the Supreme Court should have been a single determination – not three determinations, which thereby left it to Parliament to figure out what to do with multiple determinations. (2) the Bill should have been referred back to the Supreme Court after amendment, which in this instance would have required 154 G (2) (b) and 154G (3) (b) to be suitably revised so as NOT to require a referendum. This did not happen. (3) when the then Parliament decided to retain the original provisions and delete one of the two requirements needed to make the Bill legal, it acted arbitrarily and in violation of the determinations of the Supreme Court. What is ironic is that to this day the very provisions namely 154G (2) (b) and (3) (b) that 5 Judges of the then Supreme Court determined qualified for a 2/3 majority and a referendum remain totally intact in its original form. In short, the then Parliament failed to realize that in the instance when one or more Provincial Councils do not agree, two conditions need to be satisfied for the Bill to be legal, namely a 2/3 majority and a referendum. The fact that the then Parliament arbitrarily altered one of the above qualifications without altering the provisions make the Bill unconstitutional and therefore illegal. 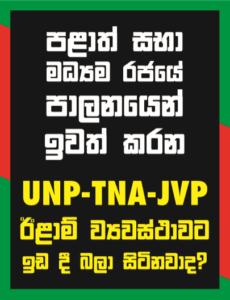 The consequence of Parliament’s action is that in the event a majority of Provincial Councils oppose a Bill, Parliament could pass it with a 2/3 majority in complete disregard to the will of the provincially elected representatives of the People. This is a grave injustice. The inclusion of an additional measure of a referendum by the People was indubitably to prevent their sovereignty being violated. Notwithstanding all of the above, these issues cannot be raised at this point in time since the Constitution does not permit judicial review outside a defined period. This is categorically stated in Article 80 (3) of the Constitution. This Article states: “Where a Bill becomes law upon the certificate of the President or the Speaker, as the case may be, being endorsed thereon, no court or tribunal shall inquire into, pronounce upon or in any manner call into question, the validity of such Act on any ground whatsoever”. This Article prevents anyone challenging the legality of the 13A. However, since Article 4 of the Constitution grants both Legislative and Judicial powers of the People to Parliament it should be possible for Parliament to grant the Supreme Court the authority to re-visit the legality of the 13A. Such an opportunity would give the People the opportunity to redress a long felt grievance as to the legality of how they are governed. The front advocating the repeal of 13A could garner considerable support if the trajectories of an alternative are outlined. To repeal 13A without an alternative would be to create an administrative vacuum and those currently associated with Provincial Councils would be in limbo. However, considering the diversity of opinions expressed by way of alternatives to 13A it would be unrealistic to expect a meaningful alternative to evolve through public debate or group discussions. Under the circumstances the most appropriate venue to undertake such an exercise would be the Parliamentary Select Committee (PSC) appointed for this purpose. Instead of mandating such a Committee to evolve an alternative from scratch it would be more productive for Parliament to debate within a specified time frame and set the outline of the contours within which the Committee is tasked to develop the framework of the desired alternative. Since the procedure proposed would take time, an interim arrangement needs to be set in place to facilitate a smooth transition. Allowing the Provincial Councils to function under current provisions while the alternative is developed by the PSC is not desirable in view of all the negative aspects of 13A; the most adverse of these being Police and Land Powers. Therefore, Parliament needs to pass an interim Bill. Such a Bill could outline the contours of the preferred alternative together with the deletion of objectionable provisions in the 13A. For instance, such contours could recommend the District as the primary devolved unit with power further devolved to local governments and grass roots levels. This could be strengthened with power sharing arrangements at the center with District representation in the form of an Advisory Council to the Executive. In addition it could propose deletion of Police and Land powers together with other objectionable provisions until the alternative is worked out by the PSC. The passage of such an interim Bill would legitimize the process and the country would be aware of the broad outlines of the political arrangements to follow. Since the process would give all political parties and interested members of the public the opportunity to participate in evolving the alternative it would be a truly autochthonous exercise. What is attempted herein is to propose how the issue of the legality/constitutionality of 13A could be revisited and transitional arrangements could be set in place until an alternative to 13A is formulated by the PSC. Whatever procedures are adopted, the stark reality is that an opportunity has presented itself for the country to evolve a fresh political arrangement with which to consolidate its hard won peace. This is a moment that country needs to seize for the sake of this and future generations.